Clearly, there’s no shortage of data and possible social media success metrics. Advanced social media analytics and ROI calculations often require tying together disparate systems, and looking for causation (or at least correlation) between social media success and business outcome. At the most granular, day-to-day level, this necessitates visiting your various outposts and your social media hub, determining your progress on each, and graphing it out over time. Or, you could just use Swix, the super slick new social media scoreboard that just works. Swix aggregates as many as 100+ of your social media metrics, and presents them in a unified, visually digestible fashion that will be the darling of any Excel hater. Need to see the increase in Twitter followers over time? Presto, a pretty graph in about 3 seconds flat. Want to compare the historical growth of your RSS subscribers to your YouTube channel subscribers? Done. Want to print out all your key metrics on one piece of paper, for easy distribution and circulation within your organization? Click. To build your Swix success metrics (which they call “pods”), you just log-in to your various social outposts or hubs, and agree to a data exchange. If you have all of your passwords and such handy, the process should take about 5 minutes. The Swix team understands that to understand social media’s true impact, you must track over a lengthy period, while simultaneously accounting for external factors that could skew results disproportionately. Thus, they have a built in “Events” tool where you can plug in anything out of the ordinary, and that occurrence will show up in your integrated Swix reporting. A new product launch. A write up on a blog. Trade show. New YouTube video that goes viral. You’ll be able to easier understand how these events drive social success using Swix. On the ROI front, Swix CEO Scott Lake (@scottica) told me that the company puts as much emphasis on tracking the “I” as they do the “R”. That’s why there’s a built-in calculator where you can input your costs (hard costs + labor costs) for each social media outpost, and the system automatically calculates your ROI. For example, you can determine in an instant what the cost and return per view is for a YouTube video you spent $5000 on to generate 25,000 views. The math isn’t that tough – you could do it yourself – but the ease-of-use and data presentation of Swix is exceptional. For now, Facebook doesn’t allow outside access to Facebook fan page metrics, so that’s the one large hole in the Swix data set. Mr. Lake believe that access will be granted however, allowing his company to deliver a whole suite of new Facebook data points into the Swix system. Swix also plans to publish its own API so that third-parties can push and pull Swix data into other applications. A white label version for agency use is also in the works. 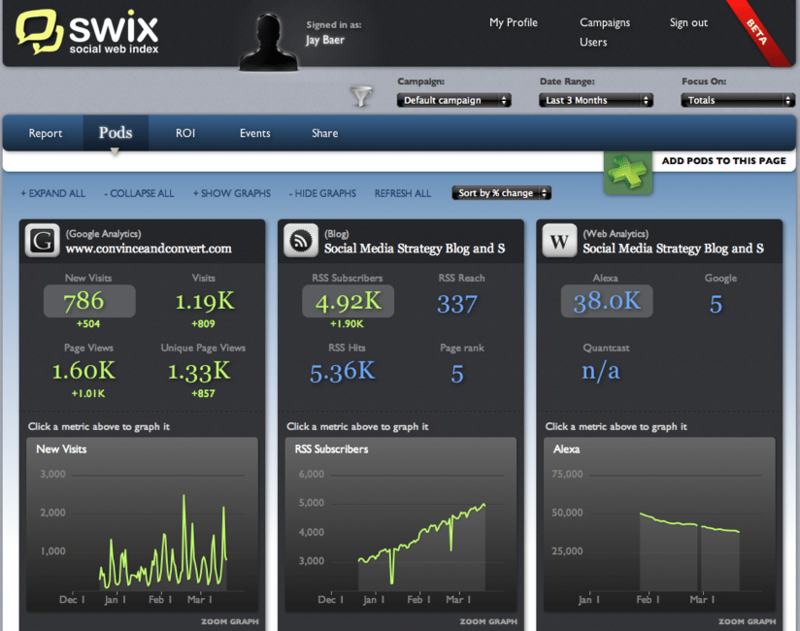 For now, Swix is in beta, and very much wants feedback from people interested in social media measurement. They’ve only been around approximately 8 weeks, and they already have thousands of customers. For now, the service is free, so if you’re interested, sign up soon. Mr. Lake told me that beta customers are likely to receive a discount when Swix switches over to a monthly fee service. I’m a big fan of these guys. They solve a problem, and they solve it well (and for now, free). Check it out and let us know what you think in the comments, won’t-cha?